The vest has side Velcro adjustable straps. Because of how they are positioned, you’ll only be able to snug down the vest by about 2” total or you can open it up further by about 4” total. So with style, you’ll be able to customize the fit more than with other Black Brand vests. 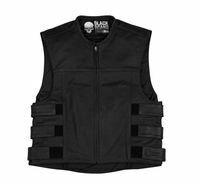 The Pinion vest offers a more “tactical” style with a lot of adjustability trough the torso. Black Brand says: Built from rugged top-grain leather the Pinion vest has the features you want in a tactical-style vest. Smooth-working YKK® zipper and a left- and right-side conceal carry pocket, along with three hook-and-loop adjustment straps on each side and an inner full zipper in the liner for easy patch attachment add up to a great vest.